Happy Martin Luther King Jr’s Day! I remember back in 1983 feeling very strongly about the importance of having a day of remembrance for Doctor King; former President Reagan did the right thing for our country when he signed the bill ushering into law a national holiday for Martin Luther King Jr’s memory, not just him the man, but Doctor King, the ideal, the symbol of something far greater and far reaching, the fight to strive for equality in all of its expressions; equal opportunities, equal possibilities, equality in pay, equality in access to education, housing and food security. I believe that Martin Luther King Jr was more than simply about race relations; he was about humanity, our shared humanity and we desperately need more people like him. 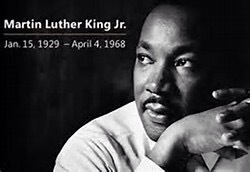 If we can all be a little bit of Doctor King in our daily life, all of his dreams may come to fruition in some not so distant future. We will never know if we don’t try. One of the world’s greatest men.